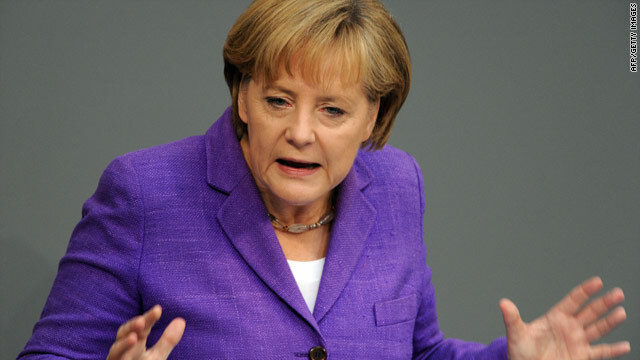 German Chancellor Angela Merkel is targeting speculators who she believes are jeopardizing the euro's future. London, England (CNN) -- German authorities have acted against what Berlin views as destabilizing speculation in the financial markets by implementing a partial ban on naked short-selling of certain stocks. Here is a guide to the practice and what the ban means. Q) What is short selling? A) Short sellers are institutions or people who bet on the price of an asset going down. What they do is borrow the share or bond or whatever it is, sell it for the current price, and then buy it back again once the price has dropped. Then they hand it back to whomever it was they borrowed it from and then pocket the difference. Q) Slow down. How does that work again? A) Let's say you think shares in Widget Enterprises are overvalued. They're currently changing hands for 120 euros, but you're convinced they're going to dive. So you find someone who's holding the shares, borrow them off them, then sell them to somebody else for 120 euros. Now you wait till the price drops to, say, 110 euros, and buy them back again at that price. Hand them back to the person you borrowed them from and -- Hey presto! You've made 10 euros per share. Q) So what is naked short selling? A) Not as shocking as it sounds -- no clothes will be removed. Same idea, really: it's betting on a fall in the price of the assets. But instead of borrowing from somebody else, the short sellers actually sell shares they don't own or hold, trusting that they will then very soon be able to buy them at a reduced price and "cover" themselves that way. If the market snaps back, they then lose money, though, and we've seen this happen as recently as this month. Q) So why have the Germans introduced this ban? A) Germany's Chancellor Angela Merkel aims to declare war on the financial market speculators who she believes are putting the euro's future in doubt by driving down the value of European assets. So she's instructed the German financial regulator BaFin to impose the ban, and from midnight German time on Tuesday evening, there has been no naked short selling of euro denominated government bonds, the credit default swaps ("CDS") associated with them and shares in Germany top ten financial institutions. It's hard not to see a bit of politics here: EU financial support for Greece and other debt-ridden eurozone nations is about as popular in Germany as a beer mug with a hole in the bottom, and Merkel has had to defend the recent EU support plan to legislators in the Bundestag -- not an easy gig. Q) Does it apply anywhere else -- like London, for example? A) No. But there's a mystery here. The German Finance Minister Wolfgang Schäuble says the German financial regulator BaFin is going to go first, and others will follow, as agreed at Tuesday's meeting of EU finance ministers in Brussels. Trouble is, the other ministers must have dozed off at that point, because none of them seems to remember saying that. So Berlin is going it alone, and that's an unusual, if not doubtful strategy. Q) Has this happened before? A) Yes. Similar bans were introduced late in 2008 at the depths of the financial crisis when Lehman Brothers was going to the wall and financial markets were in a selling frenzy. That's another reason for skepticism about Germany's renewed ban: it smacks of the kind of panic that gripped the world then, and sends a very negative signal. Q) Is it likely to work? A) In the immediate short term, a ban on naked short selling will obviously limit the volatility. But overall we're seeing a very negative reaction on the market, with the euro coming under pressure on the foreign exchanges, which are unregulated and therefore the ideal place for investors to vent their spleen. That tells you a lot. The idea that any marketplace is open to sudden government intervention is quite damaging, and will limit investors' willingness to put their precious money into it. How would you feel about joining in a game of football if you knew the referee was liable to change the rules at a moment's notice.